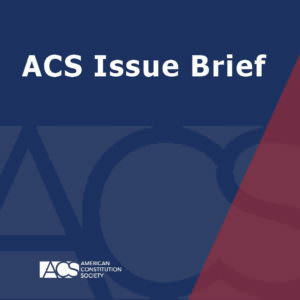 ACS is pleased to distribute an Issue Brief by Jay Stanley, Senior Policy Analyst at the American Civil Liberties Union's Speech, Privacy and Technology Program, entitled “The Crisis in Fourth Amendment Jurisprudence.” In this Issue Brief, Mr. Stanley discusses the possible threat to Americans' privacy as rapid advancements in technology are placing stress on slowly evolving legal doctrines. He argues that "the broken state of our jurisprudence is a serious problem, and poses a substantial risk that advancing technology will leave privacy law in a dysfunctional state and the Fourth Amendment an empty shell." To emphasize the incongruity between fast moving technological change and the state of the law, Mr. Stanley points out that "[w]e are rapidly moving into a new world dominated by biometrics, location tracking, social networks, pervasive surveillance cameras, data mining, cloud computing, ambient intelligence and the 'Internet of things,' and a trend away from individual, case-by-case surveillance and toward wholesale, automated mass surveillance." Yet, the Fourth Amendment, which is "the constitutional amendment that most directly protects our privacy," "was created largely in the 1970s by men born between 1898 and 1924." Mr. Stanley argues that even though our "evolutionary system of jurisprudence sometimes seems simply overwhelmed" in the privacy context, there are several reasons to be hopeful that the law can begin to catch up to our changing world. Among these reasons, which he discusses in the Issue Brief, are dramatic changes regarding First Amendment rights that occurred in the first half of the 20th century, showing that substantial change in the law is possible; vigorous dissents in cases establishing our current privacy jurisprudence that highlight the complexity of the issues and may provide the reasoning necessary to support a change; the possibility of agreement among liberal and conservative jurists, who have both raised concerns about the law; and developments in the law by state courts that highlight the problems with the Supreme Court's jurisprudence in this area. Mr. Stanley contends that "[u]nlike so many other rights, privacy in America today is actually in many respects far weaker than in the past." Nevertheless, he argues that "privacy will never stop being a vital human right," and change in the law is possible, but "[w]e must work to make this happen, lest America become a meaner, less forgiving, less just, and less free place."